In Christmas 2006, is going to be completed the biggest restoration project in the world. Parthenon, Propilea and the temple of Athena Nikki will welcome 2007 without wooden horses. Acropolis. The symbol of Athens. From the time it was constructed until our days leads-for different reasons in each historic period- the proceedings of Greece. The most significant archaeological site of the capital and one of the most important monuments all over Europe has been in the front page in the international press not for its historic role but for the course of its restoration work. The course of works has rived the public and has been commented variously from the international press as the wooden horses make the place look more like a building site and the visitors mutter as they are not able to enjoy the most beautiful creation of ancient times. 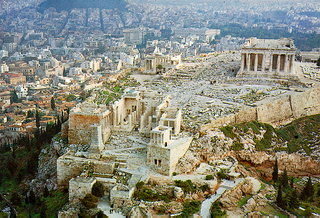 The restoration project of Acropolis is of high importance because of the monument's risky state. Filling 30 years from the beginnings of the restoration work in Acropolis, the Under-Secretary of Civilization Mr.Tatoulis gave a press conference, with participation of Mrs. Maria Ioannidou, manager of the Preservation department of the Acropolis Monuments and the president of the preservation Committee of Acropolis Mr. Haralampos Mpouras, and announced that the project will be completed at the end of 2006. Parhenon, Propilea and the temple of Athena Nikki will be given to public without wooden horses, while in the same period the museum of Acropolis will be ready as well. The visitors then will be able to see the monuments and the impressive results of the hard work that lasted three decades. According to the President of the Preservation Committee of Monuments in Acropolis Mr. Haralampos Mpouras, the only one serving the committee during the last 30 years and is well aware of the works, the delays are due to many factors. Most important of them are: sleazy, like the hidden wounds discovered from architectonic members that have been restorated, the severe weather conditions, the apparatus deadlines and the personnel strikes. The professor stated that the issue is the quality of work done not the time it is completed. Each architectonic member is treated as a unique piece of art. Since Periklis' times there has never been a systematic work to Acropolis' monuments. And have occurred earthquakes, fires, etc. That's why every delay is justifiable. "At this time three works are in progress: in Propilea, in the temple of Athena Nikki and in Parthenon that are about to finish officially next Christmas. These are projects related to the state of the building as it was impossible not to reconstruct them", stated the president of ESMA Mr. Mpouras. And added that the time schedule includes programs of remedy, incorporation of members and intervations for improving the appearance of Acropolis (restoration of the long walls of Parthenon, accommodation of the Picture- gallery, preservation of the walls of the Sacred Rock, preservation of the ground,) and is scheduled to finish in 2020, estimated of 60million Euro. "Up until now, more than 1.000 architectonic members have been taken off the monuments, more than 1.100 have been filled in with 320sq.m of marble and about half of them have returned to their places", said the manager of ISMA Mrs. Merry Ioannidou to show the dimension of this project that is now in its most important phase. The west frieze of Parthenon whose preservation is completed with laser will be exhibited in the Acropolis' museum after it is cleaned in the conservation laboratory (laboratory of Papakonstantinou) and after the place is formed properly (with cost 30million Euro) at the end of the year. In the Sacred Rock are located 6.000 blind pieces, of unknown source, in 4 stone piles, that were gathered within 2 years and will be in the laboratory in the future. The structural reclamation of architectonic members is explored also (connections of fragments with bars of titanium, fillings with new marble). The Under-Secretary of Civilization Mr. Petros Tatoulis mentioned the matter of exquisite know-how that is an important factor in the international market concerning the restoration of monuments. There will be an incorporation of the interior walls in Parthenon. In the 400 out of 700 ancient stones have been found their initial locations, but the static problem must be solved as their inner sides are burn and must be filled with new material. Over the gate of Opisthonaos must be put the marble transom of 7,5m length and 12,5ton weight. This hulking building is located in Parthenon and it's waiting to go back to where it belongs replacing the old one made of cement that is there during the last 20 years. A roof will be placed in the Picture-Gallery in Propilea (in the right of the monument). The old wooden roof covered with marble stones will be replaced, as there have been found the walls and the holders of the roof. For the first time we will see then a part of Acropolis roofed, something that will add o its protection. There will be restoration projects in the Acropolis' walls and in the ground of the Sacred Rock that is now defeatured from the transportation of soil. All these work aim to remedy the monuments and to better the picture of Acropolis. Been to ATTICA ? Share your experiences!